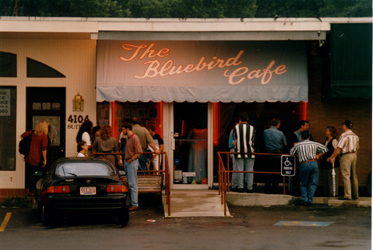 For 15 years the Bluebird Cafe has hosted many of Nashville's finest songwriters in a very intimate setting called In The Round. This format puts 3 or 4 compatible songwriters on stage at the same time, seated in a comfortable semi-circle arrangement. The songwriters play their songs, trade off turns, and often join in with each other adding harmonies, guitar licks and percussion parts. In this format the audience hears hit songs as well as great uncut treasures. The format encourages conversation between the writers, which gives the audience an opportunity to hear these creative people talk almost as if in their own living rooms. The writers perform the songs the way they were originally written, and talk about how they got the ideas, how the songs got cut, about the creative process, and what it is like to be a songwriter. Our songwriters have written #1 charted songs, Grammy Award winning songs and Country Music Association Award winning songs. Many of the songs are most familiar to country music fans, but the presentation is very acoustic, with more of a folk feel. Quite a few of the writers have written songs that have been successful outside of country music, including songs that became hits in the adult contemporary market or on pop radio. Sometimes the best material can be songs they wrote for themselves, or their children; the songs they think will never make it to radio. 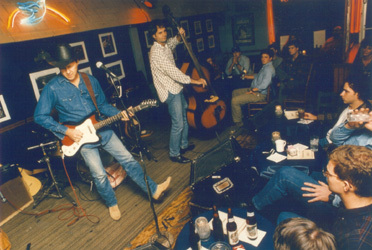 Bluebird Cafe's In The Round shows have performed very successfully at other venues such as New York's Bottom Line and The Disney Institute, as well as other college. corporate, and convention events. Bluebird Cafe's In The Round presentation can accommodate workshops and provide time for a Q&A session after the performance. The writers like to talk about the writing process, almost as much as they enjoy performing. Why Write Songs? A discussion of both the creative and the business side of songwriting. When did I write my first song? Who are my influences? What makes a great song? How do I get a song recorded? What is it like to have a song recorded? How do I get paid for writing songs? Let's Write A Song. The artists will ask the audience to bring song ideas and titles to the workshop. The writers will cull through these ideas and discuss which might make good songs. They will spend the rest of the workshop time writing a song based on the best of the audience input. This process will require an understanding from the audience that the finished product is the property of the writers, even if the song idea came from an audience member. The song will be played at that evening's show.